Innovative Approaches to Addressing Aviation Capacity in Coastal Mega-regions | Resource Systems Group, Inc.
RSG served as the prime contractor for a major study of potential solutions to airport and airspace capacity issues in the highly congested US east and west coast mega-regions. The wide-ranging project scope included a detailed assessment of several strategies for reducing delays at the major airports in these regions. 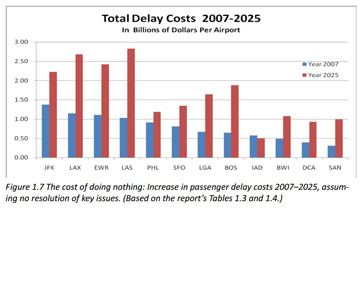 The project report describes issues and opportunities for each of the major airports in these regions, detailing also the costs of doing nothing – representing an aggregate additional burden of over $12 billion per year in passenger costs from delays compared to 2007, not including airline and airport costs. The report details the potential effects of intermodal strategies using high speed rail lines to either substitute for certain airline flights or to complement air service by providing shorter distance feeder services to longer distance airline services. A review of the intermodal role of similar services in Europe provides additional context for how new rail service might affect air service in the United States. The potential applications of several airport demand management strategies are outlined, including both regulatory and market-based approaches. 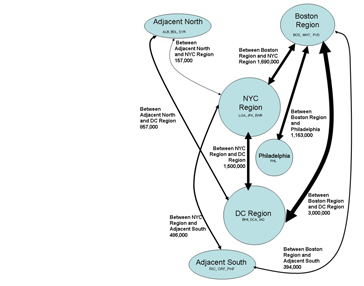 In addition to the report that has been widely disseminated throughout the industry, a web-based tool was developed for examining air passenger flows at both regional and airport-specific levels. This tool provides airport managers and aviation system planners with detailed information that is used to evaluate air network passenger flows, supporting airport and network planning.